The dry side of an Ore Preparation Plant breaks down chunks of mined ore, removes oversized debris and provides critical storage for the processing plant. Learn more about OPP-Dry facilities in the oil sands. The dry-side of Ore Preparation (often referred to as OPP-Dry) is where oil sands is first received from the mine and prepared for slurrying. OPP-Dry involves breaking down the mined ore, removing any oversized material and storing at least 30 minutes of feedstock in case of a supply disruption from the mine. One of the biggest costs for any oil sands mine operator is the number of haul trucks needed to supply oil sands to the processing plant. Location and layout is a very critical factor when designing OPPs, particularly the dry side. The bulk handling plant is normally built closer to the mine pit, often a considerable distance away from the processing plant. Crushing plants are typically installed at a lower elevation, or in-pit, to help minimize elevation changes and reduce diesel consumption for the haul trucks. Conveyors are then used to transport the oil sands to the Slurry Preparation Plant (or OPP-Wet). When mined oil sands is first hauled to OPP, the trucks dump their payload into large hoppers. Apron feeders installed underneath the hopper feed a steady stream of oil sands to the crushers (or sizers) which break down any large chunks. Conveyors installed underneath the crushers transport the loose oil sands to the downstream storage pile or surge bin. The hopper, apron feeder and crusher is often located in one single structure, tucked into a retaining wall inside the crusher pit. The main feed conveyor is located underneath the entire structure. 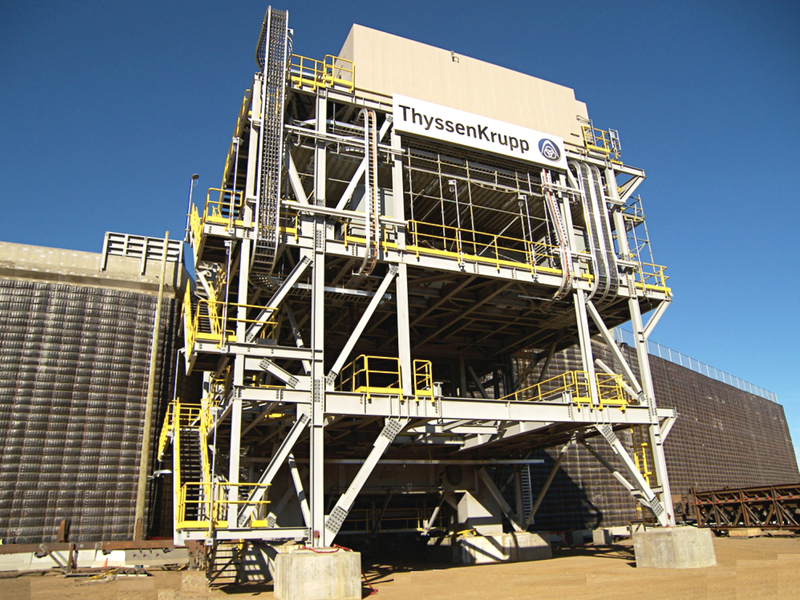 ThyssenKrupp is by far the most common supplier of primary crusher installations in the oil sands. The latest generation of these semi-mobile crushing plants are delivered to site in large modules and are designed to be disassembled and relocated, if required. A retaining wall is built to house the crushing plant and conveyors located below the crushers or sizers. The conveyors transport the ore up and out of the crushing pit. Conveyors are an efficient and cost effective method of transporting the ore from a lower to a higher elevation. 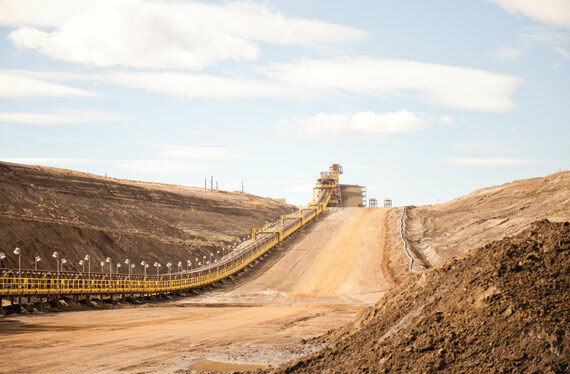 The retaining wall is built to support the weight of the large mining trucks as they drive up to the edge of the wall and dump the oil sands payload into the crusher dump pockets. 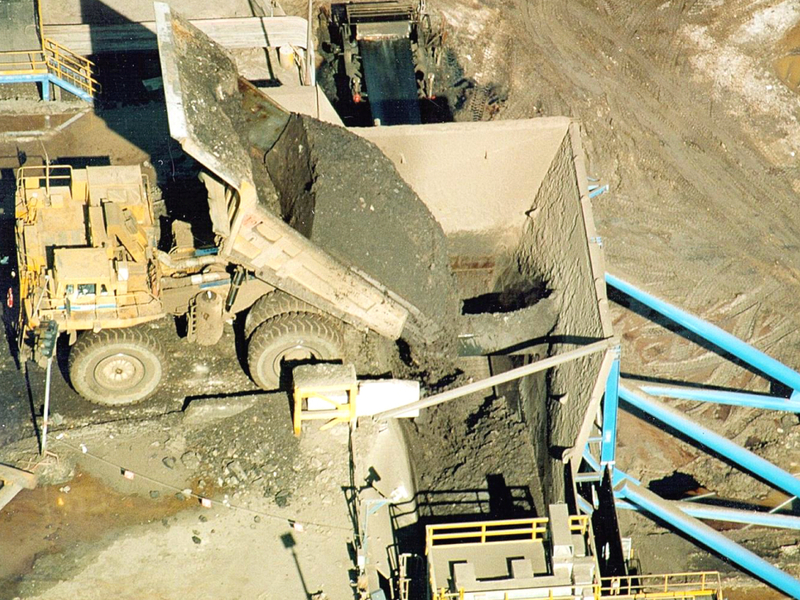 EXAMPLE OF TRUCKS DUMPING MINED OIL SANDS INTO THE TOP OF A CRUSHER INSTALLED WITHIN A RETAINING WALL. THE MAIN FEED CONVEYOR UNDERNEATH THE CRUSHER TRANSPORTS TO OIL SANDS TO THE STORAGE BIN. Traditionally, retaining walls were built out of precast concrete slabs. Since the crushers are relocated periodically, the retaining wall need not be a permanent structure. Wire mesh facing on top of backfill material is therefore becoming more common for newer constructions, providing a cheaper and lighter alternative to concrete, which can be very expensive and hard to source in northern Alberta. Sand, gravel and lean oil-sands are commonly used backfill material, which must have adequate structural stability. These walls are known as MSE (mechanically stabilized earth) walls. For structures that do not require a long life, layers of geotextile fabric can also be used to retain the backfill material. This fabric is then covered with a heavy-gauge wire grid. 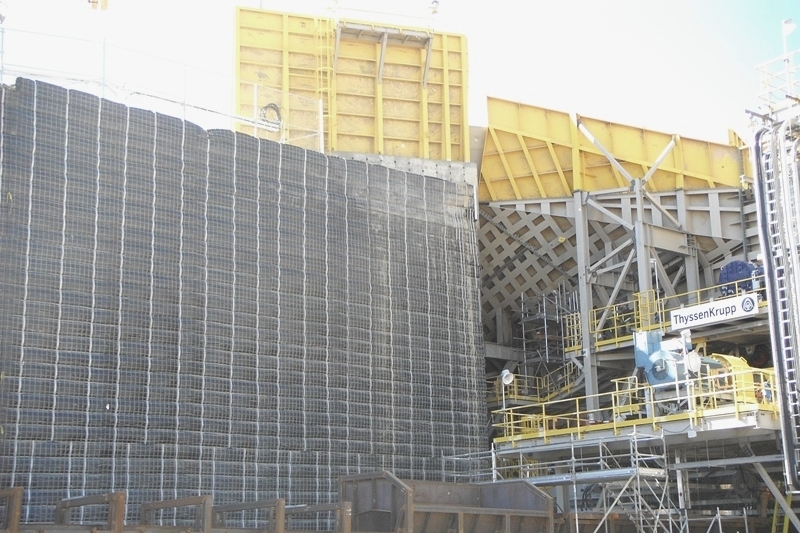 If something more permanent or longer lasting is required, gabion-type rock lining is used underneath the steel mesh. As the loaded haul trucks drive from the mine up to the top of the crushing plant, the driver reverses and backs-in towards the dump hopper. A concrete curb or barrier lets the driver know how far back to reverse. This prevents the massive truck from damaging the edge of the dump hopper. Most OPP facilities use traffic light signals to let the driver know when it's safe to dump and which side of the hopper to use (for 2-sided hopper). Radars are used to measure the operating level of the hopper. When the hopper is full, a red stop light alerts the driver to wait for an all-clear signal. Once the hopper empties, the traffic light turns green, giving the driver an all-clear to safely dump the oil sands. Cameras are also typically installed at the truck dump site, relaying the video feed to the main control room. Hoppers are normally constructed of steel and are typically lined with wear-plates to reduce wear and tear. Some hoppers are also equipped with electric heaters which prevents the oil sands from sticking to the inside of the steel bin. Most hoppers are designed to accommodate two mining trucks dumping at the same time. These diamond-shaped double-dump hoppers are normally sized to hold about 1,000 tonnes of oil sands. Single-dump hoppers are still commonly found in older mining facilities and have a considerably smaller holding capacity. AERIAL VIEW OF A CRUSHER INSTALLATION WITHIN AN MSE WALL. Tractor-type apron feeders are commonly used in the mining industry. The top of the feeder is normally covered with ribbed steel beams or plates. Two parallel sets of rollers and chains slowly pull the steel plates towards the discharge chute (or inlet) of the crusher. Since apron feeders are installed beneath the dump hopper, they must be designed to take a significant amount of impact from the falling chunks of ore. The travel speed of the apron feeder is normally adjustable and can speed up or slow down depending on the level of oil sands in the hopper or surge bin. This helps prevents overloading of the crusher. Apron feeders are typically a few meters wide and installed at an angle, feeding up into the crusher. 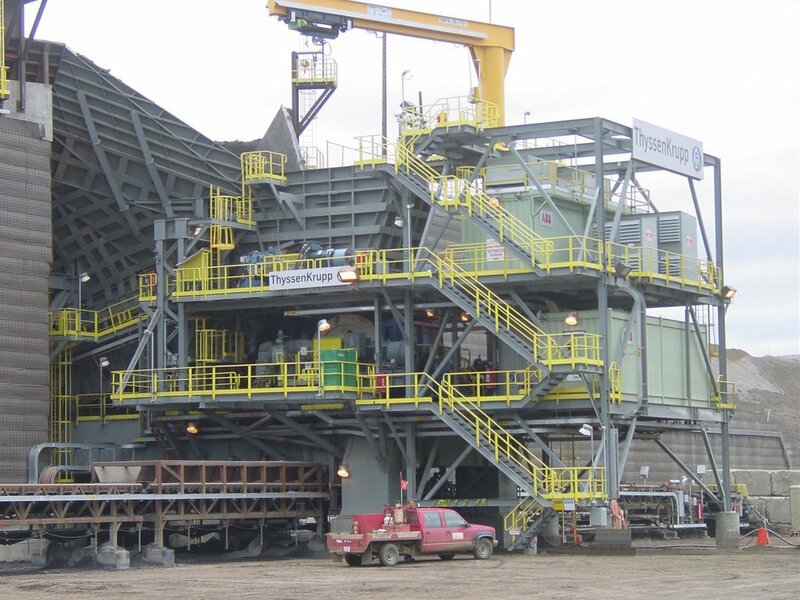 A dribble-belt or spillage conveyor is installed underneath the apron feeder to catch all the oil sands that sticks to the metal plates and falls from the bottom (return) side of the apron feeder. The dribble conveyor collects the spilled oil sands and feeds it back into the crusher. 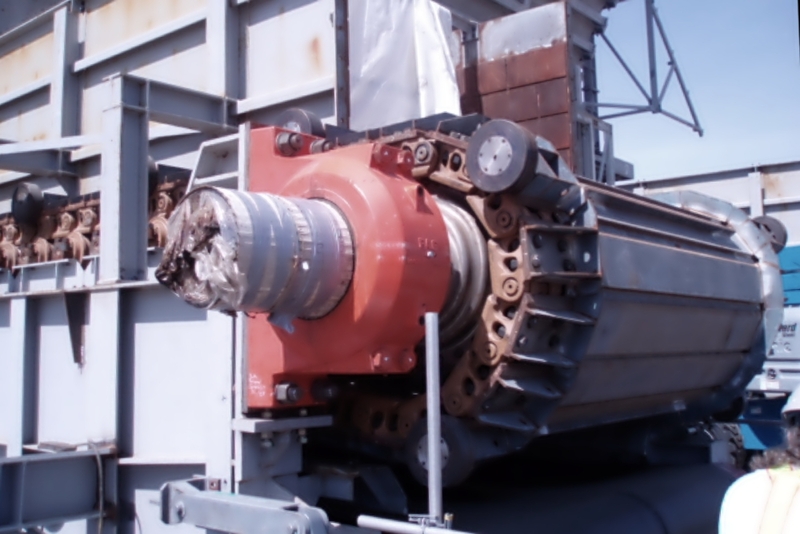 A double-roll crusher works by compressing the mined oil sands between two rotating rollers, which are equipped with wear-resistant teeth. As the rollers rotate towards each other, they compress the ore, breaking down any large chunks of ice or debris. 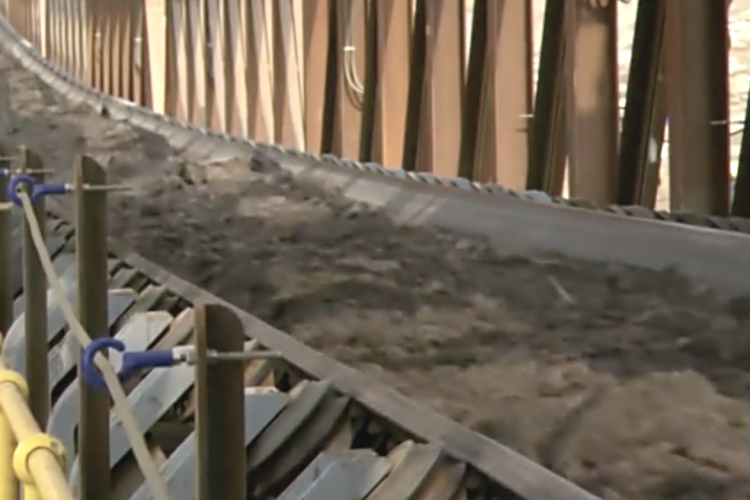 The crushed oil sands is pulled down by the rollers and falls onto the conveyor belt located underneath the crusher. The space between the rollers is adjustable and sets the maximum top size of material feeding into the wet side of the OPP plant. The normal distance between the rollers is 400 to 600 mm (or 16 to 24 inches). The rollers are driven by very large and powerful motors, normally 1000 to 2000 hp in size. Crushers used in the oil sands are designed to take large chunks of ice, up to several meters long. The rollers are also normally equipped with hydraulic cylinders that enable some "float" or kick-back during jams. This prevents the crusher from overloading when a large piece of unbreakable debris or ice comes through the crushing plant. The speed of the rollers can also be adjusted. If more throughput is required, the rollers can be sped up and process more material at a faster rate. In newer installations, radars installed on the top of the crusher feed chute will signal the rollers to speed up when the feed chute fills up and slow down as the chute empties. 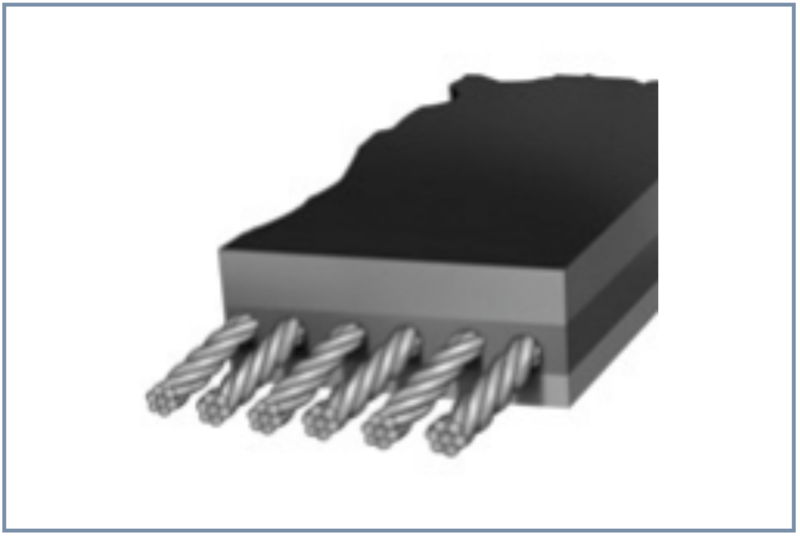 However, faster operation of the crusher puts more stress on the motor and increases the wear rate of the crusher teeth. The roller teeth are covered with wear-resistant caps. These caps wear down and are periodically replaced. Both the feed and discharge chutes are normally covered in wear-resistant plates to minimize erosion. As in the case of the main dump hopper, many crusher chutes have electric heating elements to prevent the oil sands from sticking. Although crusher capacities can vary between the operators, most crushers have a nominal (steady-state) capacity of between 8,000 to 10,000 tonnes per hour. 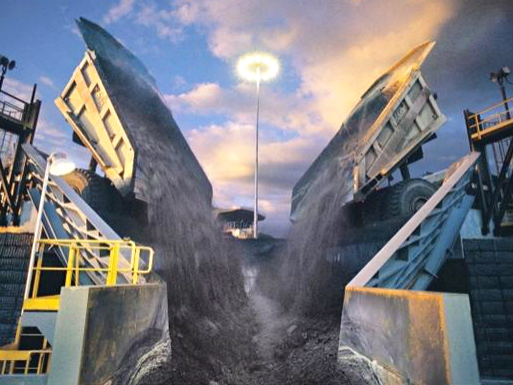 The largest crushers used in the oil sands have a peak processing capacity of 15,000 tonnes per hour. Crushing is a technology borrowed from the hard rock mining industry, where large rocks are crushed into smaller pebbles. Although crushers are used in the oil sands, mined oil sands isn't technical "crushed", since oil sands deposits are a loose and unconsolidated mixture of sand, clays, water and bitumen. However, when oil sands is mined, it often contains sections of dense, compacted oil sands mixed with chunks of ice or petrified wood. Oil sands crushers help break down these clumps into a loose feedstock that can be more easily processed through the plant. In conventional mining, double-roll crushers are sometimes referred to as "mineral sizers" since they reduce the size of the largest chunks without pulverizing the smaller particles. 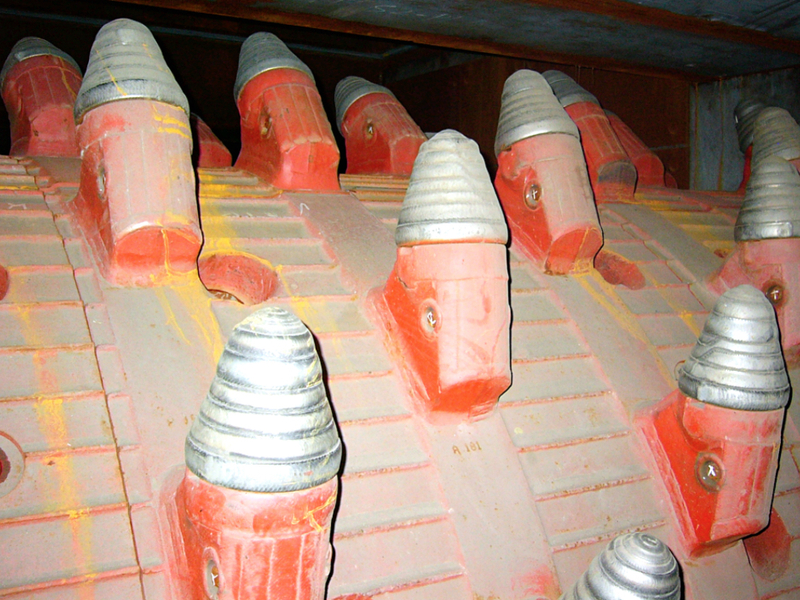 These types of crushers or sizers are commonly used in reducing the top-size of soft or sticky material, such as limestone or lignite (brown coal). Most of the Suncor material handling plants use sizers manufactured by MMD Sizer. Most other oil sands operators use double-rolls crushers supplied by ThyssenKrupp. Although the equipment may have different names, their design and operation is very similar. In fact, the two terms (double-roll crusher and mineral sizer) are used interchangeably in the oil sands industry. A number of drive stations are located along the length of the conveyor. These drive stations control the speed and tension of the belt. Motorized drive pulleys pull the belt. Idlers (non-motorized pulleys) are positioned along the length of the belt and serve to keep the belt in alignment. Pulley-cleaners are installed on the back of each pulley to clean-off the sticky oil sands. Conveyor belts are normally constructed of layers of steel, fabric and vulcanized rubber. A mixture of glycol and water is sprayed onto the underside (or return side) of the belt. 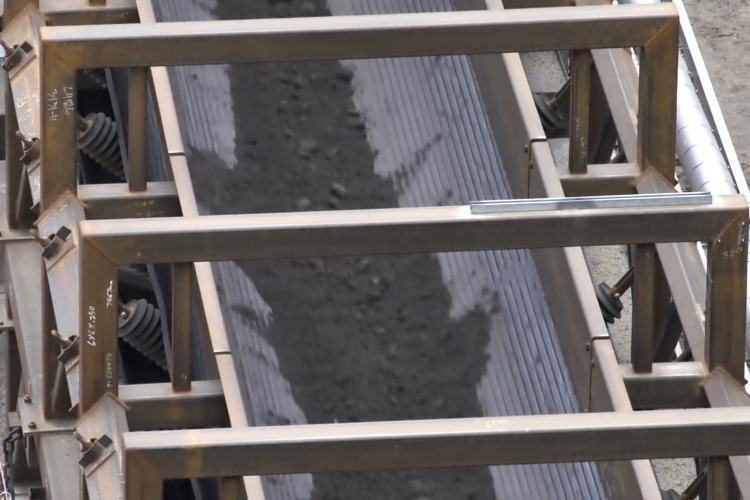 This belt-wetting system prevents the oil sands from sticking to the conveyor belt. Conveyor belts are commonly equipped with weightometers that estimate the weight of oil sands being fed to the plant. Conveyor weightometer readings are compared to weightometers installed on the haul trucks in order to calculate the amount of oil sands delivered from the mine. Operators must keep close measurement of the amount of oil sands mined and must periodically report their production numbers to the Alberta Energy Regulator. Oil sands conveyor belts are equipped with numerous safety system which are designed to protect the belt and any personnel working in the area. Since the belts can be several kilometres long, a minor misalignment can lead to serious equipment damage. Instruments installed along the length of the belt will alert OPP operators to any misalignment or "side travelling". Rip detectors will alert of any potential tears in the belt. Metal detectors are commonly installed at the front end of the conveyor belt, warning of any large pieces of metal in the oil sands (typically wear plates or crusher teeth caps that may have come loose during ore handling). Some facilities will also use diverter gates to remove any significantly oversized metal objects. A trip cord is positioned along the length of the conveyor. In the event someone or something accidentally gets caught in the belt, pulling the trip cord will instantly stop the belt. The accidental catching of loose clothing within conveyor belts is a major cause of injuries in the mining industry. The Muskeg River Mine (MRM) main conveyor belt is one of the largest and most powerful belts in the world. The steel-cable belt, manufactured by Goodyear, is covered with vulcanized rubber for added strength and durability. The MRM belt is almost 2.5 meters wide, 1.5 km long and driven by a 10,000 hp motor. The belt weighs 315 tonnes and can withstand a total weight of almost 2,000 tonnes without breaking. 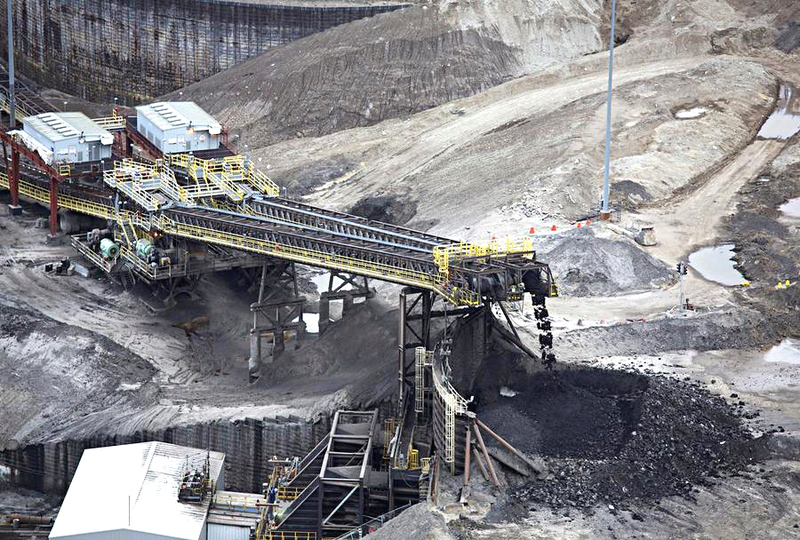 In February 2006, a liner from a mining vehicle punctured the belt, resulting in a long, lengthwise tear that required several weeks to repair. During shift change or lunch breaks, there can be a short pause in oil sands delivery to the plant while the new crew of operators take over. During the spring thaw, when the ground is soft and muddy, loaded haul trucks often get stuck or struggle to drive up the soggy hills, sometimes interrupting the flow of feed to the plant. Whenever a mining shovel breaks down or needs to be moved, it can take up to an hour to re-establish oil sands supply to OPP. As with any process, steady operation is key to maintaining good operating efficiency. Feed outages to the main plant can be very disruptive to the process. The storage pile or surge pile normally provides up to an hour of oil sands, enabling the Bitumen Production plant to continue operating normally. Although every plant uses a different form of ore storage, there are 3 basic types of storage used in the oil sands: (1) stockpiles, (2) concrete silos and (3) surge bins. The simplest form of ore storage comes in the form of a stockpile, a technology borrowed largely from the coal mining industry. 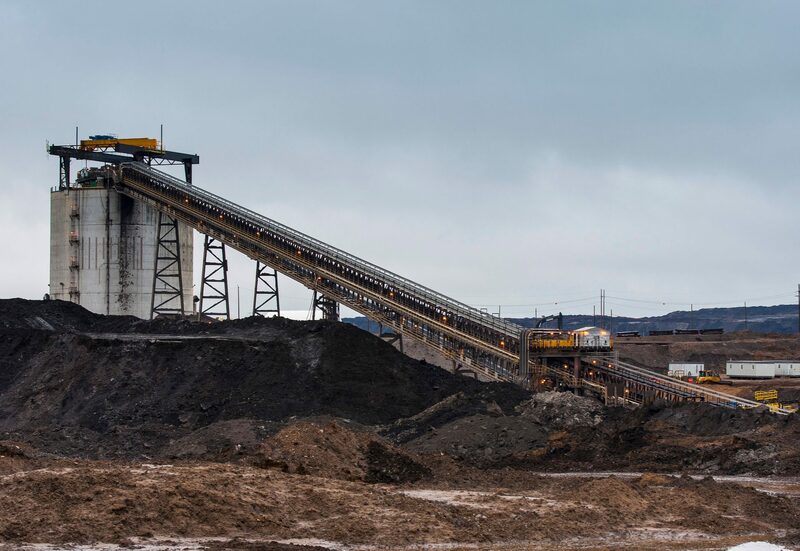 The oil sands is transported from the crushing plant using the main feed conveyor, which dumps the ore into a heap or pile. Apron feeders are installed in a tunnel below the stockpile, running down the centre directly below the outlet of the feed conveyor. Bulldozers are used to push the oil sands from the outer edge of the pile into the centre, ensuring none of the ore is wasted. Stockpiles obviously require the least amount of capital to construct but do require constant "grooming" since an operator is required to move the material from the edge to the centre of the stockpile so it can be reclaimed by the apron feeders below. Another drawback of the stockpile is a larger footprint over traditional bin design since the oil sands tends to spread out over a large surface area. Stockpiles are more commonly found at older OPP installations. 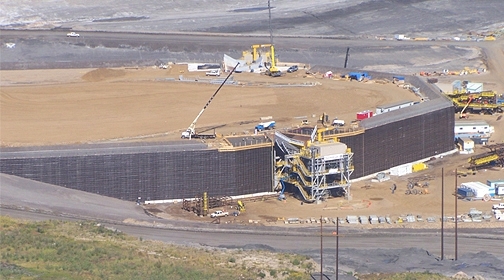 DUAL FEED CONVEYORS DISCHARGES INTO AN OPEN STOCKPILE. APRON FEEDERS INSTALLED UNDERNEATH THE STOCKPILE TRANSPORTS THE ORE TO EACH SLURRY PREPARATION TRAIN. DOZERS ARE USED TO SHOVEL THE OIL SANDS TOWARDS THE OUTLET. Storage silo technology is borrowed from the conventional mining and the agricultural industry. Much like a bulk storage bin, silos have an angled bottom which helps prevent the formation of any dead-spots in the bottom corners and ensures the oil sands smoothly flows onto apron feeders installed below. Muskeg River is currently the only operation to use an oil sands storage silo. The open-top concrete structure is 35 meters in diameter, 45 meters tall and can holds several hours worth of oil sands feed. A single feed conveyor transports the oil sands from the crushing plant, discharging into to the top of the silo. Three apron feeders located underneath the silo feed three independent slurry preparation trains. Each apron feeder pulls the oil sands out of the bottom of the silo, dumping onto a slurry feed conveyor. Each conveyor transports the oil sands to a rotary breaker located in the Slurry Preparation Plant. The main drawback of the storage silo is cost of construction. Since the silo is made of concrete, the structure is considerably more expensive than a steel bin. Silos are also permanent structures and cannot be relocated. Surge bins have become the standard for oil sands storage within OPP facilities. The large steel bins normally hold about 30 to 45 minutes worth of oil sands feed. Surge bins always have a conical or angled bottom to ensure the oil sands smoothly flows to the centre and no "dead spots" occur in the bottom of the bin. Surge bins can have one or two compartments, or hoppers. 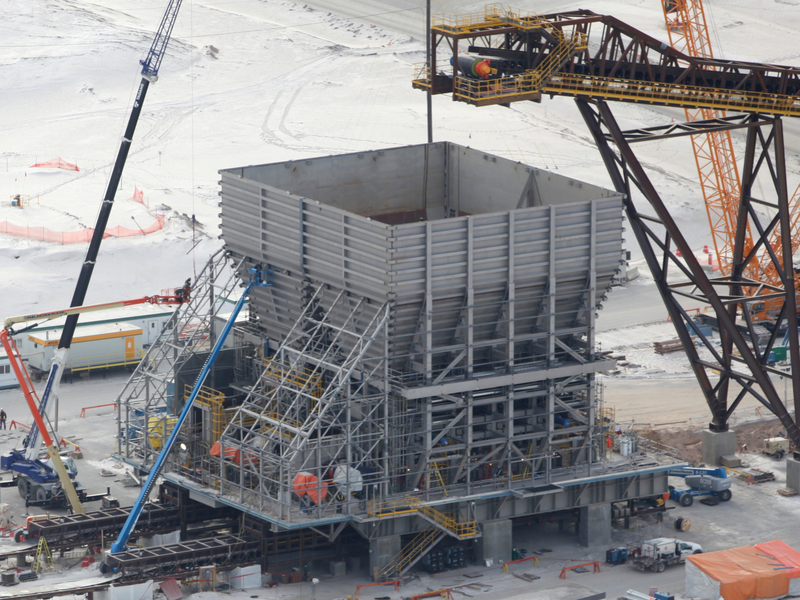 An apron feeder is positioned underneath each compartment and supplies oil sands to the Slurry Preparation Plant. Double-hopper surge bins are commonly used in newer installations. These bins are equipped with two outlets and two apron-feeders, which can feed two independent slurry preparation trains. Some operators have bins with 4 separate hoppers and 4 apron feeders. Bridging is a common problem in surge bins, which occurs when the oil sands sticks to walls on the bottom section of the bin. Bridging causes air pockets and results in uneven flow of material onto the apron feeder. Many newer surge bins used in the oil sands are equipped with air injection and heating elements on the lower half of the bin to prevent the oil sands from sticking to the metal plates and keep material smoothly flowing to the outlet. A SINGLE FEED CONVEYOR DISCHARGES INTO THE BIN FROM ABOVE. TWO OUTLET CONVEYORS DRAW FEED FROM EACH HOPPER, TRANSPORTING OIL SANDS TO EACH SLURRY PREPARATION TRAIN. Surge bins can be found throughout Syncrude’s mining operations, the Horizon and Kearl Oil Sands Mines, and at the Jackpine Mine Expansion plant. ThyssenKrupp is the supplier of choice for Syncrude, Imperial Oil, Shell and Canadian Natural Resources. The new Fort Hills Mine uses a FAM surge bin installation. 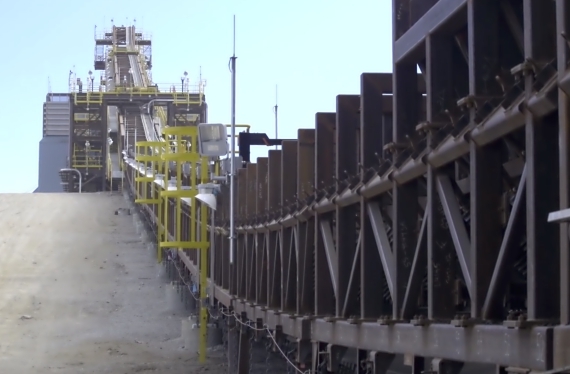 TWO SEPARATE CONVEYORS FEED OIL SANDS FROM THE CRUSHERS INTO A SINGLE SURGE BIN. APRON FEEDERS INSTALLED UNDERNEATH EACH HOPPERS DUMP CRUSHED MATERIAL ONTO INDIVIDUAL CONVEYORS THAT SUPPLY THE SLURRY PREPARATION PLAN. Newer surge bin installations are generally designed to be relocatable, should the OPP facility ever need to be moved to a different location. Regardless of the type of storage system used (either the stockpile, silo or surge bin), oil sands feeds onto conveyors through apron feeders installed underneath the silo/bin/pile. Depending on the number of Slurry Preparation trains located downstream, there could be one, two or three apron feeders located underneath each piece of storage equipment. Oil sands is transported to the Slurry Preparation Plant (SPP or OPP-Wet) using conveyors. The number of conveyors correspond to the number of SPP trains. Hot or warm water is added to the oil sands in the SPP area, removing any oversized material and producing a pumpable slurry that can be gravity separated in Extraction.